Jonathan Rea moved to the the top of the World Superbike championship series by taking a double success at Imola. 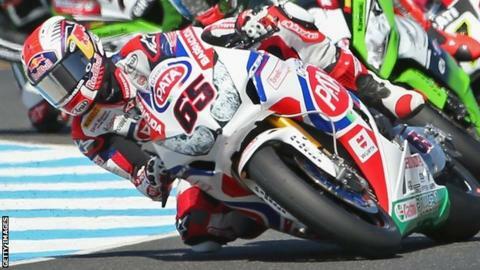 The Pata Honda rider won race one by 4.5 seconds from Welshman Chaz Davies after starting from pole position. The Northern Ireland rider saw off Davies by four seconds in race two to secure his 14th victory in the series and his third win in a row this year. Rea leads the standings on 139 points, with reigning champion Tom Sykes second on 135 and Sylvain Guintoli on 123. Monaco-based Toomebridge rider Eugene Laverty lies in a disappointing eighth position after seventh and ninth place finishes on Sunday on his Crescent Suzuki. Sykes completed the podium positions in the first race, with Guintoli third in the second race. Fresh from a win at the previous round at Assen, Ballyclare man Rea put in two dominant performances to lead both events from start to finish at Imola. "It wasn't easy, but I'm really happy to back up my win in the wet at Assen by taking two wins here. The team gave me a great bike" said Rea. "It's been a great weekend - I knew after race one that we had a really good pace but I still had to go out and win. "I'd like to thank my crew for their tireless work and hopefully I can keep the ball rolling at the next round at Donington Park, which is a circuit I really enjoy."